A poignant tribute to the Aboriginal men and women who worked in the pearling industry as ‘free divers’ in the late nineteenth century in Western Australia. 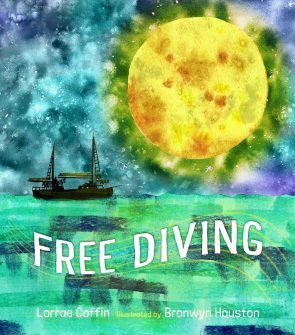 The fictionalised lyrical narrative is based on the celebrated song ‘Free Diving’ by singer–songwriter Lorrae Coffin. It sensitively reflects the emotional journey of a young man who leaves family and country to work on a lugger with Japanese and Malay divers by his side. Bronwyn Houston’s illustrations are a deep-sea celebration that illuminate both the glory of the ocean and the extreme dangers encountered by the free divers. Listen to Lorrae’s song ‘Free Diving’ on the Magabala YouTube channel.